TechPats specializes in Cellular wireless communications. We have a number of technical experts with over 25 years of experience in R&D, product development and development of standards. We have extensive expertise in 5G, 4G (LTE), LTE-Advanced, 3G(HSPA), 2G, W-CDMA, CDMA2000, EDGE, GPRS, and GSM. We also have unique testing capabilities that allow us to conduct testing in both in a lab environment (captive testing) and in live commercial networks. Other more traditional reverse engineering capabilities such as software RE and circuit extraction are also available when testing solutions are not sufficient for uncovering EoU (Evidence of Use) in IP (Intellectual Property) cases. 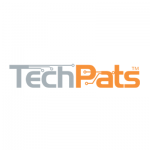 Whether it is to confirm use of an essential feature of a standard, an optional feature of the standard, an implementation specific feature related to the standard or other non-standardized feature, TechPats has a wide range of capabilities for testing those features in a lab environment and in live commercial networks. Each solution has it advantages and disadvantages and we select the best solution for our clients’ needs. Figure 1 below shows various aspects of cellular communications that TechPats has investigated over the years. The items range from Layer 1 to Layer 3 protocol interactions. The items in the solid box represent example functionalities that are routinely investigated and the items in the dashed boxes relate to other functionalities we have investigated. In this type of test environment, off-the-shelf terminals are connected via an air interface to network vendor equipment that is currently deployed and configured by a mobile service provider. This type of setup offers very valuable information into commercial use of patented features in commercial deployments. We can investigate functions both on the terminal side and on the base station side. TechPats has taken its wireless lab on the road and has used it for testing in live LTE networks deployed in Canada, the US, Germany and Japan. Over the years we have gained much knowledge on deployment of standard features in cellular networks. Figure 2 below shows a functional block diagram of a passive test setup for testing in a live commercial network environment. The test equipment is capable of monitoring the uplink and downlink transmissions OTA (Over-The-Air) between the BTS (base station) equipment at a cell tower and the mobile terminal under test. When testing BTS functionality, one challenge is the identification of the vendor of the BTS to be tested. 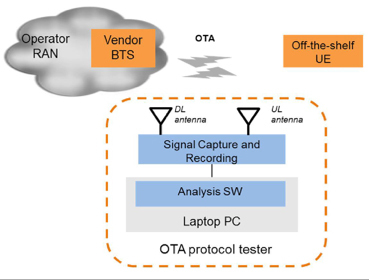 Cellular BTSs do not send signals with explicit vendor specific “signatures” that can be used to reliably identify the type of BTS or the vendor of a BTS at a particular cell tower. TechPats has developed a multi-step methodology that enables our engineers to identify the type of BTS (macro, pico), the standard supported (LTE, WCDMA) by the BTS and the vendor of the BTS equipment at a particular cell tower. A second approach for conducting live network testing involves the use of an instrumented UE (User Equipment). An instrumented UE is a mobile device that works with special software that enables the monitoring of baseband processor protocol behavior. The Instrumented UE connects to a BTS in a live commercial network and protocol information can be extracted from the UE. An instrumented UE is a useful tool for testing a vendor BTS in a semi-controllable environment. For patents with claims directed to network devices, such an instrumented UE performs the role of a terminal emulator that can be used to trigger certain network behaviors in order to verify whether those network devices implement the functionality that is being tested. Figure 3 below shows a functional block diagram of a test configuration using an instrumented UE in a live commercial network. The instrumented UE connects to the BTS of a cell tower in a live commercial network and is coupled to a laptop that has a software application capable of monitoring the protocol behavior. With captive testing an off-the-shelf terminal is able to connect to what is called a network emulator, which effectively provides the function of a BTS with the added capability of allowing the test engineer to track the protocol messages transmitted between the terminal and the network emulator. Figure 4 below show a block diagram of a typical setup for emulator-based testing. This type of testing offers a controllable environment with the flexibility to create many test cases which may or may not be available in live network environments. These test cases can be used to “induce” a desired response/operation of the terminal and/or network.